Who wouldn’t love a trip to Disney World in February? For the past five years, a group of Roxbury High School cheerleaders have headed to Florida in the middle of the winter – but NOT to relax in the sun. Instead, twenty-two varsity competition cheerleaders will be flipping in the air, catching each other and chanting for a live crowd and millions of television viewers. They will battle the “best of the best” during the National High School Cheerleading Championship in Orlando from February 8th to the 10th, 2019. The youngest cheerleaders are in 8th grade. The oldest are seniors. They all try out every spring for a spot on the next year’s roster. Many are already gymnasts and add at least 15 hours to their total practice time to make their routines perfect for every touchdown in the fall. Meanwhile, the competition squad goes under the performance microscope in October, when their “season” begins. Preparing their muscles and their nerves for these meets takes nearly constant training. During an actual contest, “they have two minutes and 30 seconds (to perform) and they can’t go back and make it up,” Lacosta said of the pressure to perfect their stunts and tumbles. Early last month, their extra hard work paid off. The team propelled themselves to the National Finals. The RHS team won the Championship in the Super Varsity Division at the Empire Regional meet at Nassau Community College. Their performance also earned them two bids to the National Cheerleading Championships – in both the Super Varsity and Game Day Divisions. Their victory was a happy surprise for Competition Head Coach Wendy Schneider and Erin Carueto who assists the competition squad with Lacosta. For the next month, perfecting routines, getting more mileage through local meets and allowing injuries to heal are all items the competition team will check off their list before they leave for Florida February 6th. In general, a trip to Disney conjures images of waiting in long lines and big hits to the budget. Lacosta said it costs about $1,200.00 to send each cheerleader to the National Finals. Strident fundraising efforts by team members and parents knocked that number down to $300.00 this year. While that economic pressure is off, Lacosta said she expects nervousness to kick in when the athletes are standing in the arena where they will compete at the ESPN Wide World of Sports Complex. Hoping to keep the nerves at bay and stay sharp, Lacosta said the squad has booked some gym time prior to the contest. The team has some senior Competition veterans as well who are used to facing off against cheerleaders from around the country. 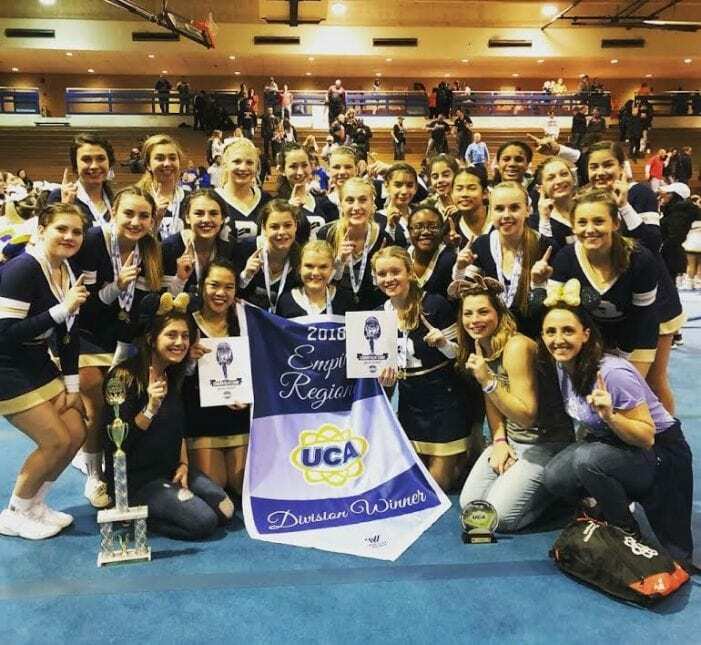 The Universal Cheerleaders Association (UCA) hosts the event, along with all the meets, camps and clinics RHS team members attend. According to their website, Varsity.com, 15,000 athletes and 50,000 spectators attended the event last year. ESPN, ESPN II and CBS Sports plan to beam their performance into homes across 32 countries around the world this year. Cheering at the National Finals is a priceless experience. It can also decrease the price tag of college tuition. “At the college level cheerleading is considered a sport and college scholarships are afforded,” Lacosta explained. “We have cheerleaders who have been told that they should be attending college clinics because they have the potential to cheer in college.” Some RHS alumnae are in fact doing just that. Roxbury’s Competition Cheer Team includes Ashley Yau, Elizabeth Poissant, Lindsey Kaiser, Deanna Maugeri, Elizabeth McDonald, Megan Merola, Adriana Hrelja, Alexandra Schulz, Allyson Calanni, Kaity Profaca, Morgan Heddy, Sarah Hills, Alexis Merola, Riley Gallagher, Willow Bradley, Lia Santiago, Angelina Marasco, Chanel Hairston-Jackson, Dana Mendelsohn, Gianna Rosario, Kirsten Mans, and Lindsey Yau. The RHS Squad, their parents and loved ones hope the foundation of their cheers and their team is strong enough to push them to the top of the podium next month at Walt Disney World.